There are few things I enjoy more than finding beautifully made, unique products that have not been mass-produced. It will come as no surprise that I love Etsy and it is one of my favorite sources for special gift ideas. This is why I was super excited to have the opportunity to review Sweet Jay Creations, a wonderful Etsy shop owned by Ashley Carson. Ashley loves to sew and uses her talents to create adorable yet practical baby items. I was lucky enough to receive a bib and burp cloth set with the most charmingly patterned fabric! 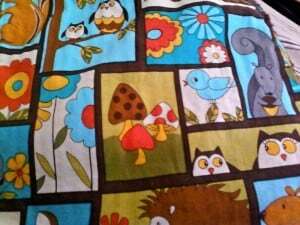 The little woodland creatures on it are adorable and I love the brown, blue and orange color scheme! The whole effect is very striking and yet still fun for kids. The back of the bib and burp cloth are lined with a super soft and absorbent brown chenille fabric. The size of each is perfect for catching all of your babies spills and spit-ups. The stitching quality is excellent. I love the pattern so much that I was almost sad to use it, but the fabrics washed well and easily. 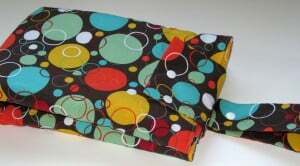 Another great product designed by Ashley is the On the Go All-in-one Diaper Changing clutch. It holds diapers and wipes and also folds out into a changing pad. This product would be extremely convenient for quick trips when you don’t want to drag a huge diaper bag. Visit Sweet Jay Creations today to shop for these and other great products, such as wet bags for cloth diapers, reusable snack bags and cuddly blankets! All of these products are thoughtfully made in a smoke-free home and come in a large variety of colorful, fun and modern prints. I think these items will make great gifts since they are well-made, reasonably priced and very useful. At the same time they are eye-catching and guaranteed to make the recipient ooh and aah! I know as a new mom that you really cherish the things that help make the day to day of caring for your child much easier. I think every mom will appreciate that these items are both stylish and helpful. Ashley is also willing to complete custom orders for her clients. One lucky reader will win a $25 shop credit to use towards the item of your choice. This giveaway is open to readers worldwide. Nicole lives in Columbus, Ohio. She loves reading, writing, playing music, and just being creative in general. She lives with her amazing husband Jeff, her lovable dog Kira and her entertaining cat Jim. I like the Owls Bib. I love the Reversible Baby Bib made with Plastic Snap and Chenille – Owls.